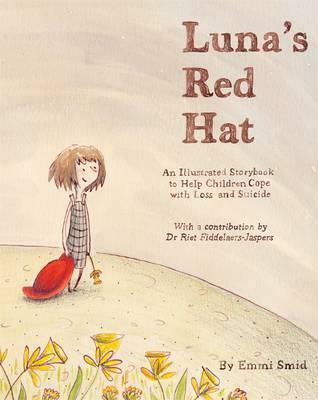 Luna’s Red Hat takes up the important subject of suicide, a little discussed taboo topic in our society. Following a beautifully illustrated story of one day in Luna’s life, we get to know how she lost her mother just a year ago and we see a father who is struggling with helping Luna understand what happened as well as coming to terms with his loss. Through the story Luna behaves realistically, though her thoughts might not be as genuine as her behavior. The loss and the lack of understanding of what happened, has made her frustrated and angry. Her father pulls er through and help her understand is small, clear words what happened to her mother as well as explaining that it was not Luna or any one else’s fault. As well as containing the small story of Luna and her little family the book ends with an informative essay by Dr. Riet Fiddelaers Jaspers. The essay outlines how to tell a child about such a thing as suicide, and why it is important to actually let the child know what happened. This book is designed to help children deal with loss and suicide, but I believe adults also could benefit from reading it.